Appetite For Life – September 27, 2017, with Folami Ideraabdullah, PhD: “Vitamin D and Human Health: 10 Things Your Mother Never Told You”. Vitamin D is an essential vitamin linked to human health and diseases such as cancer, diabetes, and heart disease. It occurs naturally in fish, eggs, and red meat and several common foods in the United States are fortified with vitamin D, including milk and breakfast cereals. Recently, measuring vitamin D status has become more prevalent as a clinical measure of health and supplementation is often recommended to restore adequacy. We will discuss what vitamin D is made of, where it comes from and how it may impact your health. View PowerPoint presentation. View video. In collaboration with Johnson & Wales University, we are pleased to present a very special event at the JWU campus in Center City Charlotte. 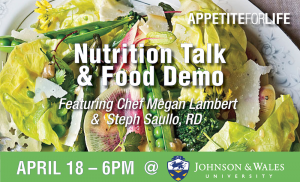 Chef Megan Lambert, MS, RD, from Johnson & Wales and registered dietitian Steph Saullo, MS, RD from the NRI will come together to demonstrate delicious, healthy cooking while sharing tips for consuming a balanced, nutritious diet. Attendees will be able to sample the fare. The location of the event is Hance Auditorium, Johnson & Wales University. View recipes. View nutrition notes. View Video. We try our best to select healthy eating choices. But our good intentions will go out the window these next several weeks as we are confronted with a whirlwind of holiday events, foods, and drinks. Adding to this stress are the emotional connections we have with favorite holiday foods and the expectations of our family and friends. 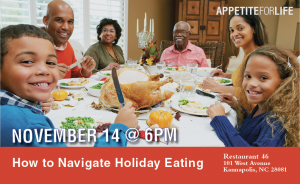 Dr. Smith will share tips and suggestions to help you navigate a precision nutrition course through those holiday temptations yet still enjoy the holiday season…all while you “eat like a nutritionist! View video. Many explanations can be found as to why certain foods are always eaten together; some actually make sense. How about whole foods? Why are certain nutrients always found together in whole foods? 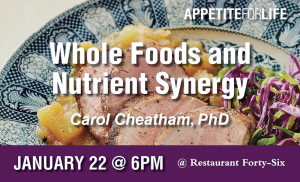 Dr. Cheatham will present the available evidence surrounding the superiority of eating whole foods to support brain development and function. After a discussion of ancient and current food practices, she will dig deeper into the idea that nutrients appear together in nature because they support each other in their functional properties. As an example, she will present some of her work showing that nutrients in human milk work together in support of infant recognition memory. 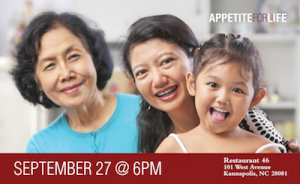 Come learn about your food and how you can best use it to fuel your brain! View PowerPoint presentation. View video. Our individual genetic differences and the environments we live and work in can interact in a number of ways to affect our susceptibility or resistance to some diseases, but not to others. Over- or under-nutrition, as well as to exposures to toxic agents at work or at home, can also affect our health and quality of life. In addition, there are particular times in our aging and development when we are more susceptible than others. 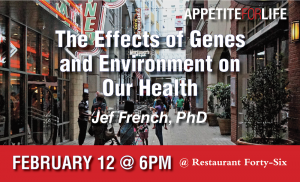 We will review and consider the latest information on new genetic tools that help inform us of our history, our ancestors’ history, and our individual differences in why some of us, but not others, may be more resistant or susceptible to gene-by-environment interactions that affect our health. A major effort at the NRI focuses on Precision Nutrition, which requires identifying individual genetic differences and how our diet or specific nutrients can modify our health. The new research tools we are developing and testing may aid human research and development of new treatment. View PowerPoint presentation. View Video. Metabolomics involves the study of the low molecular weight complement of cells, tissues, and biological fluids. Metabolomics makes it feasible to profile the biochemistry of an individual or system – providing a biochemical fingerprint. This approach is being used in studies to assess the pattern of changes (and related metabolites) arising during different periods of health and wellness and can be used to develop strategies for nutritional intervention. 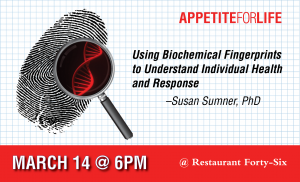 During this program, Dr. Sumner will provide an overview of studies in which metabolomics has been used to gain biological insights into pregnancy complications, autism, immune responses, and environmentally relevant exposures. View PowerPoint presentation. View video. 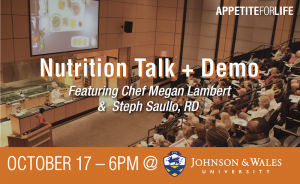 In collaboration with Johnson & Wales University, the UNC Nutrition Research Institute is pleased to present a cooking demonstration and nutrition talk at the JWU campus in Center City Charlotte. Chef Megan Lambert from Johnson & Wales and registered dietitian Steph Saullo, RD from the NRI will come together to present “Putting the Spring in Your Spring Chicken,” demonstrating delicious, healthy springtime meals while sharing tips for consuming a balanced, nutritious diet. Guests will be able to sample the fare. Space is limited. Register early for this much-anticipated event! View video. View Recipes. View Nutrition Notes. Prostate cancer is the most commonly diagnosed cancer in US men, and the second leading cause of male cancer deaths. The World Cancer Research Fund recently highlighted the striking lack of dietary and lifestyle risk factors for this disease, despite ongoing research efforts. This talk will focus on two main reasons for our lack of progress. The first is that prostate cancer, like many other tumor types, is a biologically and clinically heterogeneous disease. Therefore, until we can accurately classify biologically distinct subgroups of prostate cancer, we will be unable to identify the risk factors for these different types of the disease. Secondly, individuals may respond differently to dietary factors, based on their unique genetic make-up. 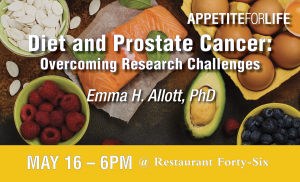 As such, it may be necessary to incorporate genetic data into studies examining the link between diet and prostate cancer. With improvements in technology now making it possible to overcome these research challenges, this talk will outline the progress we are making in identifying modifiable risk factors which will guide prevention efforts. View PowerPoint presentation. View video.